One of my favorite country music groups is Lady Antebellum. Mr. Savvy and I always turned the radio up when their very popular song "Need You Now" would come on. We would also sing along to it even though Mr. Savvy has a way of not singing the same thing they are. I laugh at some of the words he comes up with when singing with the radio. I like their new song "Bartender" too. They just harmonize so beautifully together. Why am I talking about Lady Antebellum? Well, I gave you some sneak peeks of something new last week and now I'm sharing the deets. A little over a week ago I got an email asking me if I would like to review some new bedding? Um, let me think about if for half a second......uh, yes. Y'all know I love to make up a pretty bed and when the bedding is offered to me well, who am I to say no? I know you're still thinking, but what does this new bedding have to do with Lady Antebellum? They have a new line of home decor at Bed Bath and Beyond called Heartland. I was asked to choose from their bedding line and I chose Delta Queen. There are several other patterns, to choose from, but I knew this one would be perfect for the farmhouse style guestroom. When I saw this pattern of blues, reds and creams I knew it would work perfectly in there. Actually it could work in either guestroom. I received the duvet with standard shams set and the extra euro shams plus some throw pillows. This bedding is reversible which means you can change up the look just by flipping the duvet or comforter over and turning the shams around. One side of the duvet is the red and blue pattern and the other side is neutral with the look of grain sack stripes. Here I flipped the standard shams around to the red side. I love the mix of the grain sack style euro shams with the pattern of the standard shams. The added details like the red velvet ribbon border on the duvet are nice. And added as little ties on the shams. When I was at Costco I saw these gorgeous hydrangeas and had to bring them home. The girl who was putting the flowers out said these are vintage hydrangeas. I just love how there are touches of pink and blue on a mostly white bloom. I stuck them in this enamelware pitcher and hung it from the bed post. I love how this red velvet trim was added as a border. This old quilt works so well with the new bedding so I just folded it and placed it on the bench. I also used some shams I already had in the mix. I was also sent this burlap horse print pillow and it's nice, but a bit too western for my style. This set is perfect for farmhouse style or cottage style and is really affordable. Find out more about this new line here. I was given this line of bedding to review, but of course all opinions are my own. that's so pretty. everytime I hear pontoon i think of you! Hey Kim, I love the new bedding, it looks wonderful! Just wondering where the cow picture comes from, could you share? Thanks for the info Kim. Keep up the good work, it's always fab!! Also canvas.com has the cow. I LOVE this new bedding and the shams so compliment each other!..such a beautiful line from "The Triple B"
That bedding is beautiful, I have to check it out!!! Love how you made the bed too. The velvet trim is the icing on the cake. Love your lampshades too. Beautiful room, Kim! So pretty. I like Lady Antebellum too. I can see why you chose the patterns that you did-looking good! How pretty! I never knew that Lady Antebellum had their own bedding line out! I haven't been to Bed Bath and Beyond in months. Thanks for sharing this product. I'll have to check it out! I was wondering about your pretty beddings?! Thanks for the info! I really like the two different sides. BTW, my hubby and I like Lady Antebellum, too. We were given tickets to one of their concerts as a Christmas gift a couple of years ago and it was soooooo much fun! They were fantastic performers. This is pretty, pretty, pretty. I'm huge country music fan and Lady A is intended of my favorites. How'd I not know about this? Oh my goodness that's adorable!!! Beautiful choices for that room:) I'm so happy for you Kim! It's fabulous!!! So pretty! Had no idea they came out with a linen line. LOVE the new bedding Kim...it's perfect for that room!! They certainly sent that bedding to the right person! They could use your shots in their promotional materials because you can mix and match bedding like nobody's business! The beding looks great in your room, check out the other styles and they look great also. 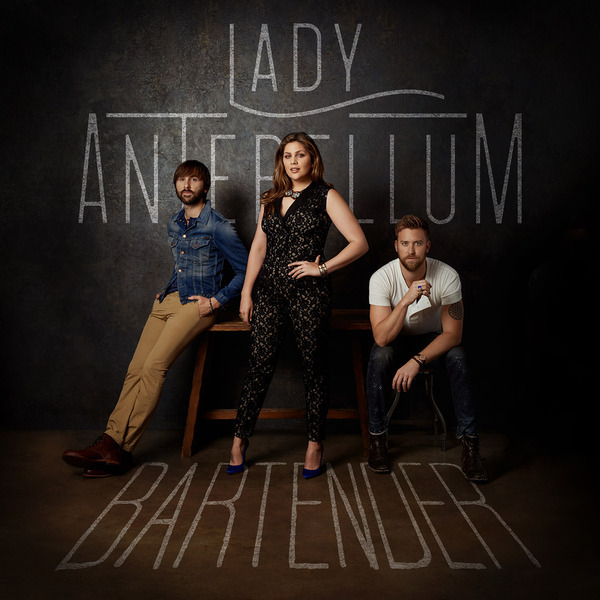 I love lady A's music also,. The flowers are beuatyfiul . I love that bedding! I had no idea Lady A had a home collection! I love their music too! Their song Compass is a favorite. Just looked at the collection.... Loved the names seeing how I am from Memphis, TN.! Can you tell me where you found the red and white striped dust ruffle? It is several years old and from Pottery Barn. That was a different post and I was wondering where you were going at first! But the bedding looks really nice and now I'll be singing "Need You Now" all day! My poor neighbours! 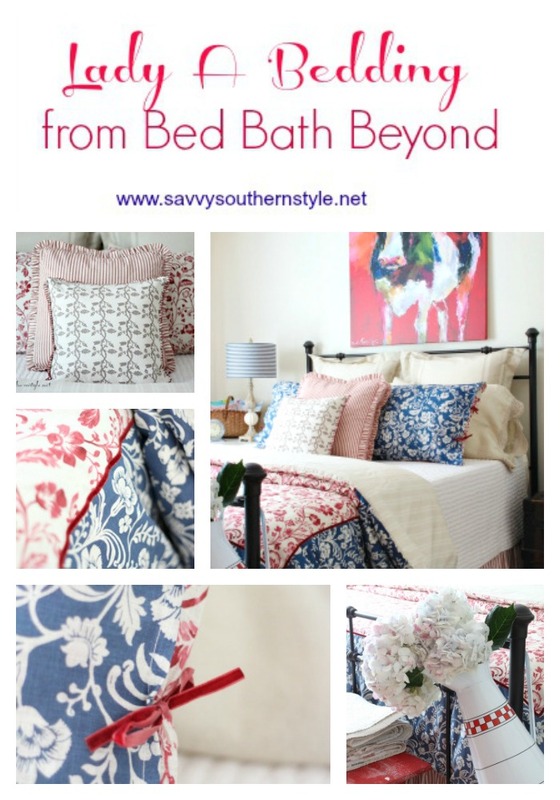 Very country and cottagey and pretty bedding~ I love how you mix it up all the time. The room looks so inviting Kim. Just curious, did you wash this bedding? I really love it, but I read some reviews that the duvet is ruined after washing it. Let me know! No, I haven't since it has hardly been used and isn't dirty. Had not heard that either. I sure hope it isn't ruined after washing. Love it! Where did you get lamps and shades?